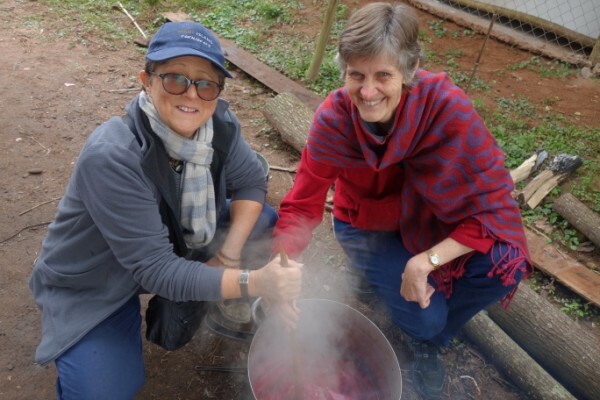 The end of January into early February was time for an adventure: a textile tour into Northern Thailand and Laos by Active Travel with Valerie Kirk. It was an amazing trip. There were 15 of us and we travelled from Chiang Mai up to the Golden Triangle and the border with China and then to Luang Prabang, a World Cultural Heritage town. I do not intend writing a travel journal. In fact this will be the only tourist photo I’ll share and with a bit of imagination it could be classed as textiles. It is just too good a photo opportunity to miss. 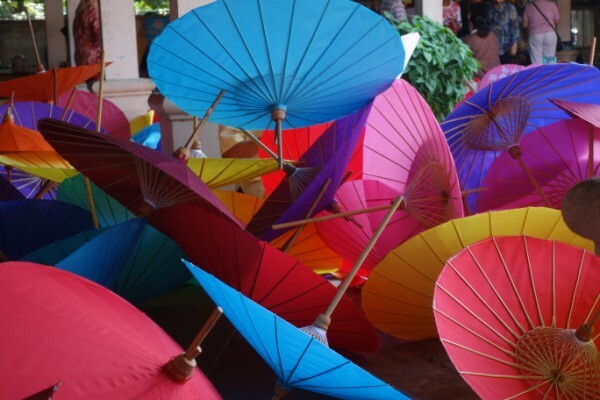 The Umbrella Making Centre in Chiang Mai is a major tourist destination. For this post I will analyse my field notes and report and comment on various textile aspects. As a starting point, I’ll identify the ethnic minority groups we came across. 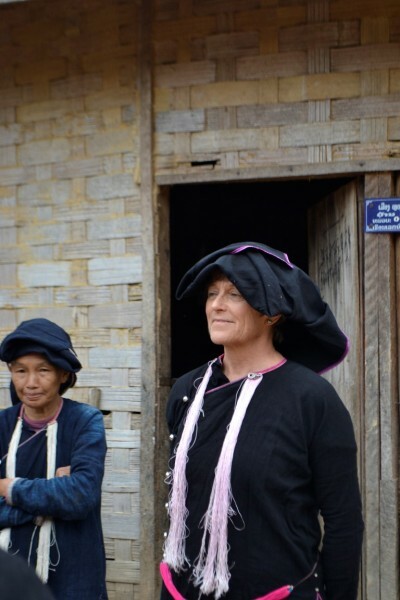 I was struck by the many commonalities that there were here and on my trip to Northern Vietnam. In reality I shouldn’t have been, as the borders imposed on countries have little relation to the movement of people. 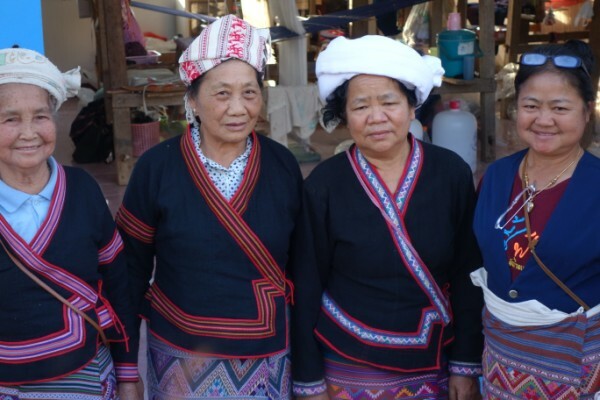 For instance the Hmong in Vietnam are similar to the Hmong of Thailand and Laos. 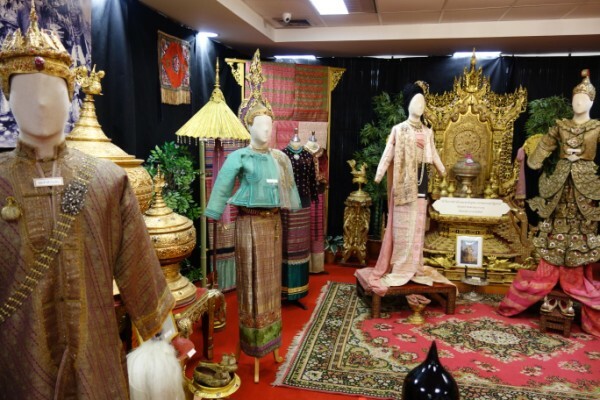 They can be picked by their very distinctive clothing especially those pleated skirts, batik and embroidery. 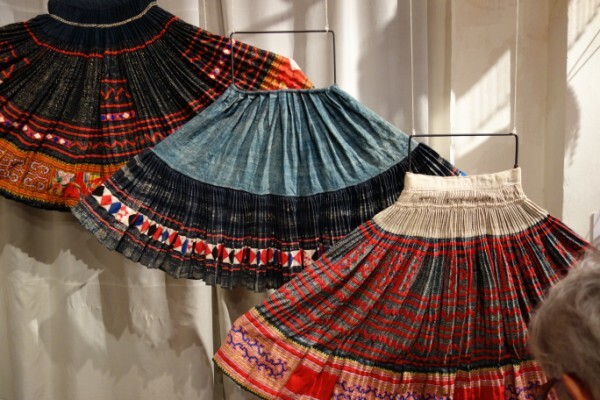 These Hmong skirts were in the Traditional Arts and Ethnology Centre (TAEC), a museum in Luang Prabang. A museum is a very good place to research traditional costume. 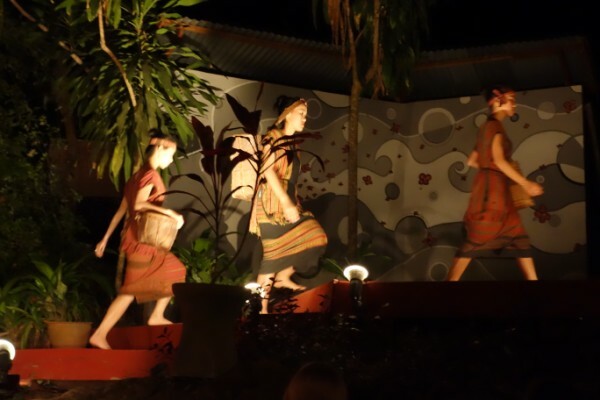 There’s a list at the end of this post for museums in Laos and Nth Thailand. 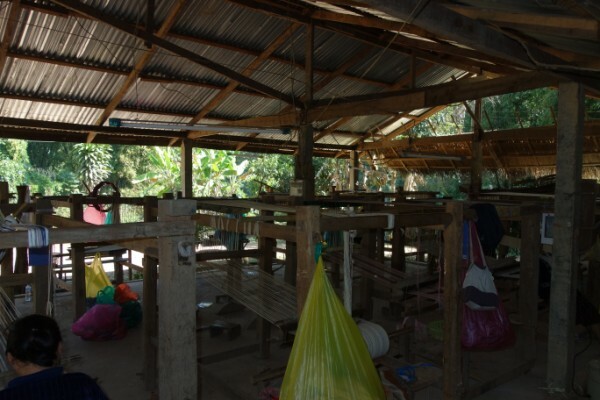 Other minority groups we saw included Tai Dam, Tai Deng, Tai Lu/e, Yao, Lanten, Akha, Lo Lo and Kmhmo. I must admit I found the spelling of some of these groups tricky as sometimes I hear them spelt differently and sometimes I’ll even see them spelt differently. It is interesting to see how costume is evolving. I have posted the costume as seen on our travels. Of course a more elaborate and full outfit could be used for major life events (weddings and funerals etc). While full historical costumes can be seen in museums, I have recorded here ‘living’ costumes as we saw them. Akha ladies are the most committed sellers. They will approach you on the street, in a cafe, at the place you are staying. 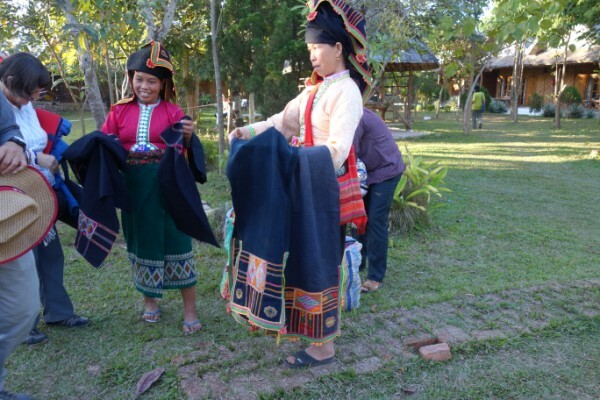 These young girls entering the village of Nam Mai where some sort of celebration was happening gave a new take on their traditional Akha outfits. There was lots of glitz. Yao ladies are immediately recognizable by the red pile and elaborate headdress . The flowers on the baby’s hat are to protect from spirits. Here the older children wore western dress. Tai Dam in traditional dress. The heavily patterned skirt can just be seen. The woven fabric for the skirt. The complex pattern is achieves by supplementary discontinuous wefts. This is extremely time consuming to weave. The elaborately patterned skirts are instantly recognisable as traditionally belonging to Tai Dam. They are a very common sight and would have to be the most frequently seen throughout our trip. Quite often anything goes on top. The skirts are colourful and attractive and easy to wear. 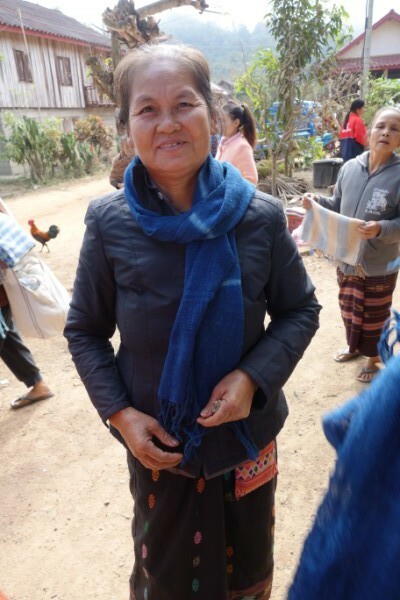 It is interesting to note that Loas government policy that ‘traditional’ skirts or Sinh be worn for government jobs and that it is in general encouraged for other work and formal occasions. As this policy is so widely accepted, perhaps using a skirt as a form identification is not a reliable guide. A question may be asked about the future of traditional dress for other ethnic minority groups and the impact of this policy. They do not have these elaborate skirts. Sometimes they are plain. Other groups also wear trousers as traditional dress. You will still see the use of traditional dress. However the incidence of its use is reducing, as Western clothing is becoming the norm and is even readily available in markets. Sometimes there is just an echo remaining. 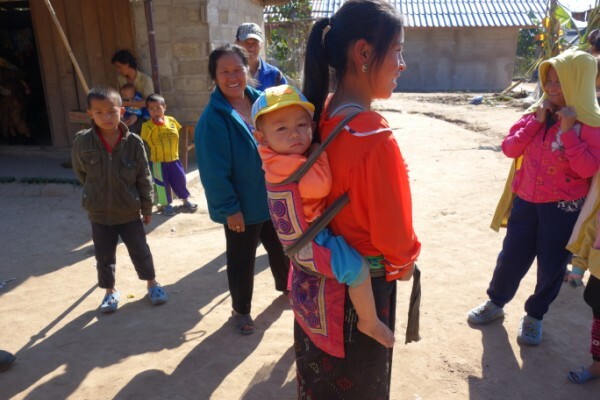 A Hmong mother uses a traditional baby carrier. According to TAEC, the Khmu no longer wear traditional dress however the use of head bands for carrying heavy loads identifies this group. 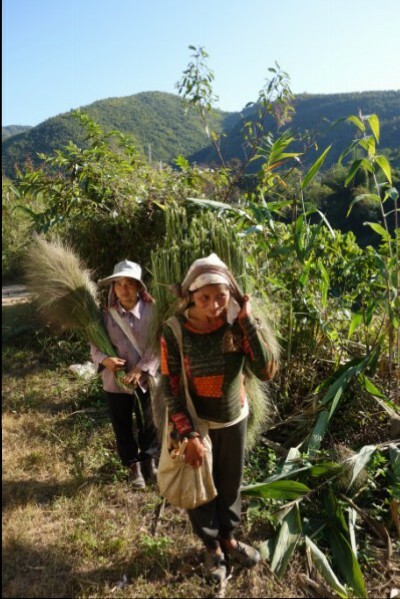 These ladies have harvested grass and taking it back to be dried, often on the side of the road. The traffic helps to loosen the seeds so that it can be made into brooms. Sometimes you have to be fortunate to be in the right place at the right time. I am including the following as they were a way of getting traditional cloth out into the wider community. In Chiang Mai we were fortunate to be there at the same time as the ASEAN conference, held at Payap university. 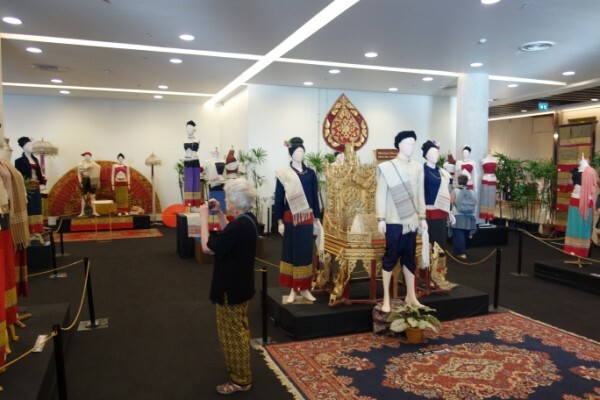 While we did not participate in any of the conference, we did get to see a wonderful exhibition of textiles representative of the ASEAN community..
Again in Chiang Mai we heard that there was an exhibition in a shopping centre. What an opportunity to connect with the young and the general public! Traditional old clothing was combined with contempoary accessories. There was a sense of excitement and engagement. At one of the local restaurants, Hive, in Luang Prabang we caught a fashion parade. The young fashion designer had taken traditional fabric and interpreted it into contemporary dress. The parade presented garments using very traditional fabric and strong links to ethnic styles through to a range of very contemporary garments which had reference to tradition but with no actual ethnic clothing. The market was for both the tourists and new age locals. I have found it an interesting exercise to try and assign aspects of textile production with an ethnic group. The following alignment of production and ethnic group is based purely on what I have seen. 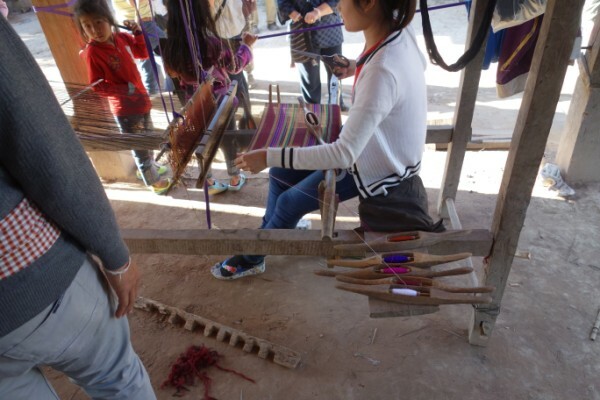 Dyes and the dyers: Hmong, Tai Lue and Tai Deng. 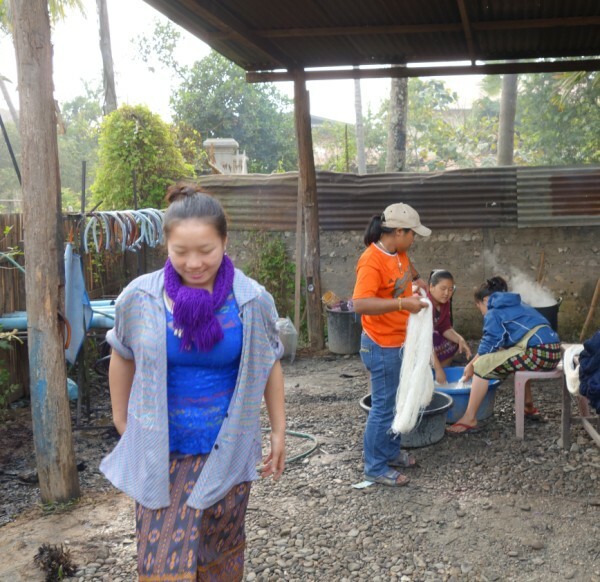 The group participated in a natural dye workshop in Ban Phieng Ngam with some Tai Deng ladies. 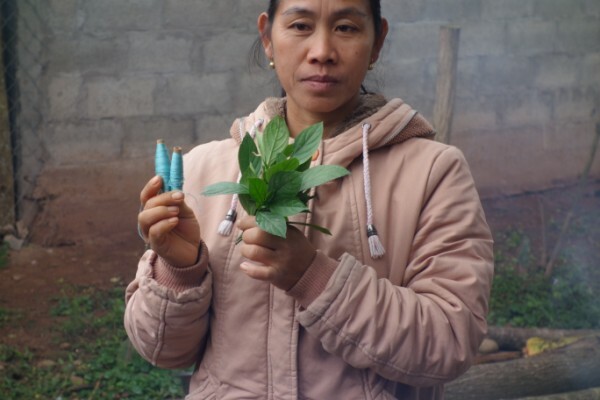 We used four dyestuffs: fresh indigo, teak leaves, sappan wood and annatto seeds. Fresh indigo achieved green though a beautiful turquoise can be achieved. Colour variations are achieved by season, the addition of ash water or rice wine. We got only green as much as we’d have preferred that turquoise. Fresh young teak leaves dyes to tan/ yellow. This was a beautiful mushroom colour. Annatto seeds dye orange. The seed case is shown. The seeds from the case. 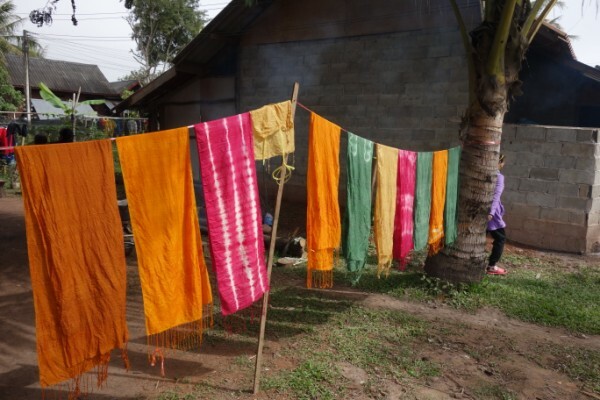 Silk handwoven scarves were provided for the workshop. They were pre-mordanted in alum (solid crystal) at ratio of 15 g alum: 10-15 litres of water. I decided I really needed to sample all dye baths so cut mine into four. The rest of the group elected to do various forms of shibori. The indigo leaves were pounded with a little water. 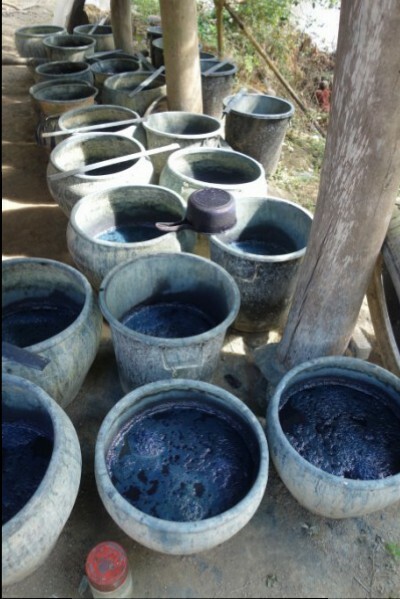 The leaves were scrubbed to extract the indigo for about 15 minutes till frothy and strained. The fabric was added and indigo bath worked vigorously through for about 10 minutes. All the other processes involved the use of fire. The teak leaves must be fresh and young. 20-30 were needed for half a pot of water and simmered to extract colour. The leaves removed, fabric added and simmered for 10 minutes. 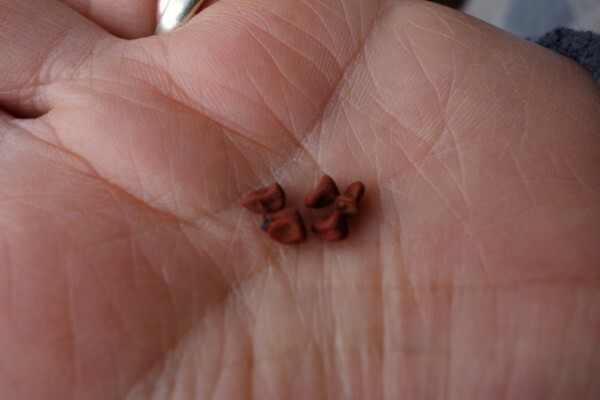 A similar process was done for the annatto seeds. The sappan wood was shredded and boiled for 1 hour. Colour could have been altered by using rusty nails or ash water. The wood removed and fabric added before being simmered for 10 minutes. Susan and I stir the pot. One of the washing lines with our samples. After dyeing, they were allowed to dry before being rinsed. When I got home I reassembled my four dyed samples into a scarf. We saw a number of indigo baths and indigo yarn and skeins on lines. 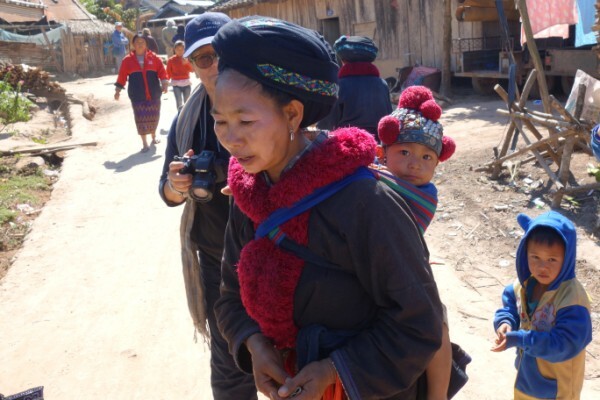 This was in the Tai Lue village of Ban Nu Nyang. A Lan Ten lady stitches while she waits for the indigo process. 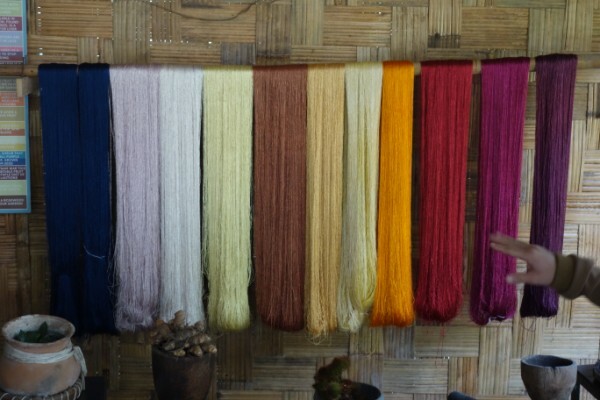 This wonderful display of natural dyed yarns was at Ock Pop Tock. 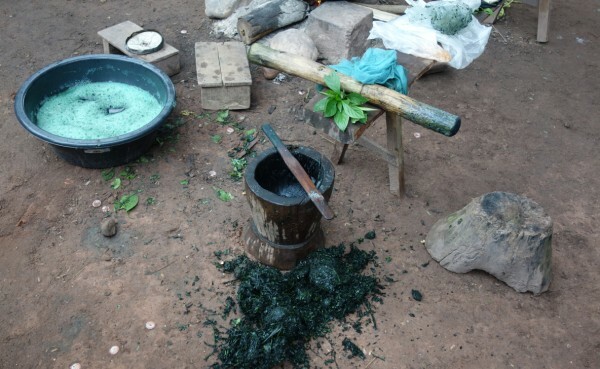 The colours from right to left were obtained from: Sappan wood (a) fermented, (b) with ash water, (c) with rusty nails, annatto seed, turmeric, jack fruit wood, mak beau, lemon grass, teak leaves (a) dry, (b) fresh, indigo (a) and (b). Resist dyeing of the yarn. 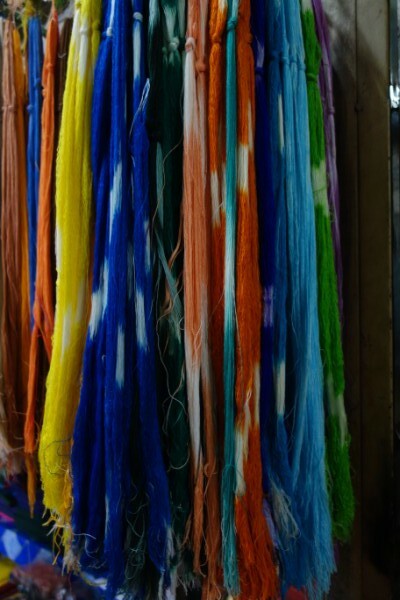 Examples of weft ikat were in museums. The technique is called mudmee (Mat mi). Contemporary weavers and companies are also drawing on these skills. 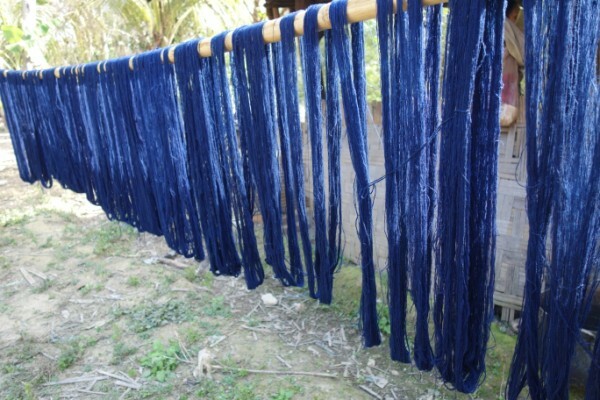 In this Tai Lue village, hand spun cotton is being dyed in indigo as a skein. The pattern shifts as it is woven with at some points it being recognisable and at others random. Both weft and/or warp ikat are being done. It appears that this village may be supplying a specific market. It is unlikely that this style of ikat would be traditional. In the marketplace it is possible to buy resist dyed yarn. I did see evidence of this being included as a stripe element in a more complex fabric. Again this would be an evolving development. Looms and the Weavers: Tai Lue, Tai Deng, Tai Dam and Lo Lo. The looms have the same framework with the basic operating method being the same. The difference is in the method of storing pattern. A loom with a vertical storage system As each pattern row is selected, the pattern sticks (or strings) move from top to bottom or vice versa. Two plain weave shafts are at the front and attached to treadles. These looms are used by the Tai Lue. They are also used by western organisations and were in fact the most prevalent loom. The pattern storage system can be identified in the image as those long vertical white threads in the middle of the loom. These looms are required to make complex patterns. A greater number of pattern sticks can be stored more conveniently than in the horizontal system. 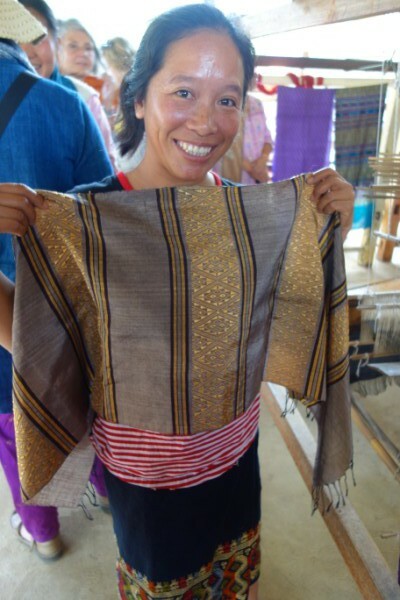 A Tai Lue weaver holds a scarf she’s woven using a supplementary weft. Notice her heavily patterned skirt in a discontinuous supplementary weft pattern which would also have been woven on this loom. 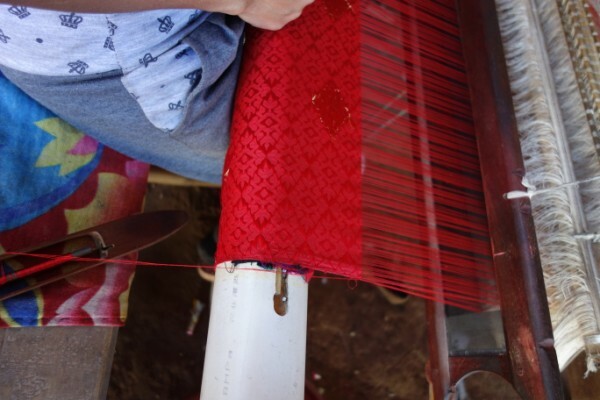 The Tai Lue also use this loom to weave tapestry bands used in combination with complex patterned stripes. A loom with a horizontal storage system. As each pattern row is selected, the pattern sticks move from front to back or vice versa. Two plain weave shafts are at the front and again attached to treadles. These looms are used by Tai Deng, Tai Dam and Lo Lo. Plain weave requires just two shafts. 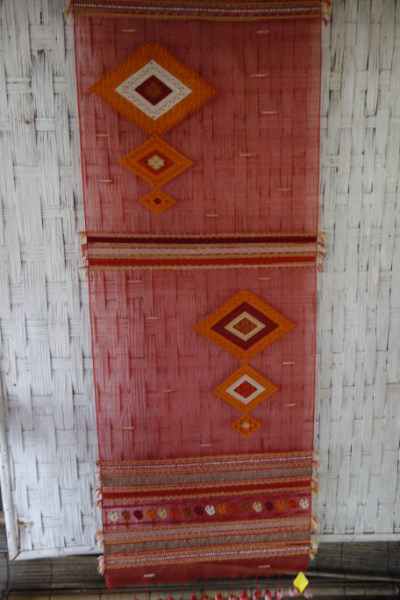 The effect of this weaving is achieved by pure use of colour. Three young Tai dam or Lo Lo girls (The villages ran together so it was hard to differentiate groups especially when there is no costume reference) weave together. One weaves while the other two prepares bobbins. Then they rotate jobs. It is great to see the younger generation weaving though I must admit the incidence was rare. A Tai Dam supplementary weft pattern in the same colour as the plain weave. 40 pattern sticks were required for this pattern. There is also a supplementary weft inlay motif. 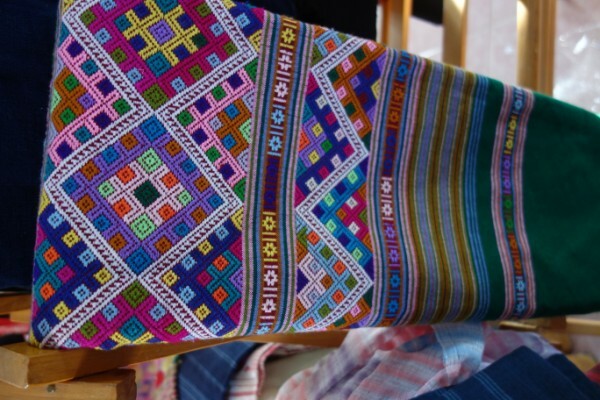 Embroidery: Hmong and Lan Ten. 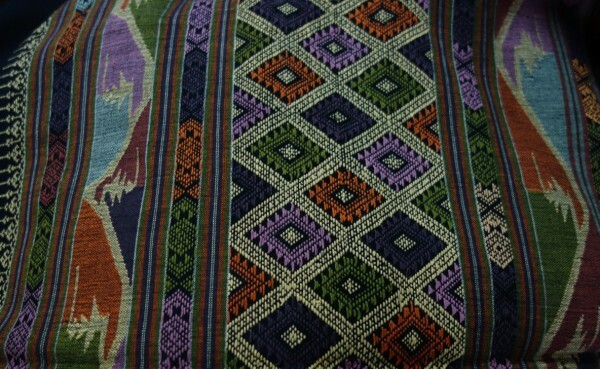 A Hmong textile in reverse appliqué. This is a very contemporary piece but draws on traditional techniques. The Lan Ten are very accomplished embroiderers. These coasters were very much aimed at the tourist market and seemed to have been made by a wide selection of ages. One saw stitching being done in the marketplace so it is an easily transportable technique. Gold embroidery. 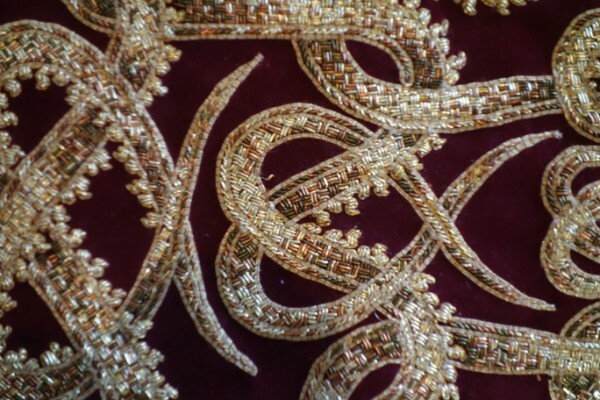 In the era of Royalty, gold embroidery flourished. The start of the Democratic Replic of Loas in 1975, resulted in things royal becoming out of favour and the practice declined. In recent years it has made a resurgence with work being commissioned for bridal wear, dignitaries, buddhist rituals, individual commissions including art work. We were fortunate to see the work of Nithakhong Somsanth. He initially studied with his grandmother but has also several degrees from paris and USA. His work is extraordinary. As well as working in the traditional style he also does contemporary gold work. Some of the tools of the trade. Note the piece of traditional gold work. 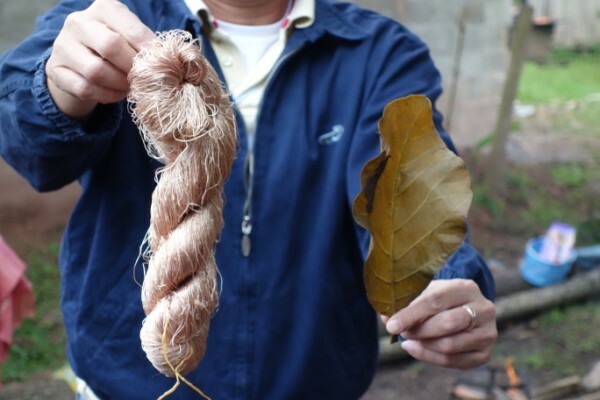 This yarn is produced from Kheuapiad, a “jungle vine” in much the same way that linen is. It may also be dyed. A darker, coarser, thicker yarn is produced from the Yaboi tree. It is then netted, crocheted or knitted into a textile by the Kmhmo. Tribal Museum (Muang Sing) Opening hours were difficult to establish but a wonderful collection and documentation of ethnic costume. Le Pavilion de Jade. (L.P.) Aimed at a high end market, scarves and wraps are in handspun silk dyed in natural colours. They look “plain” yet definitely classic. 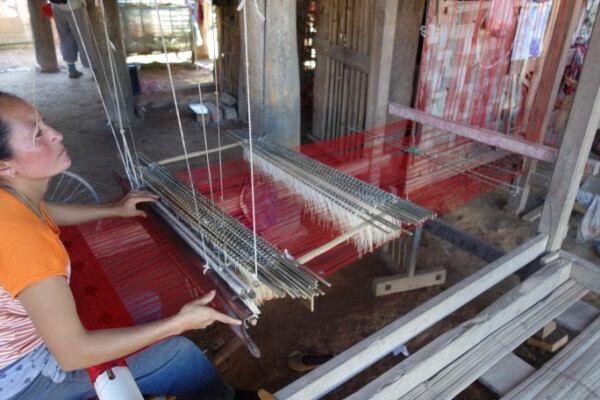 Kin Thong Lao Silk. (L.P.) Contemporary and traditional hand weaving from Xan Tai Village. 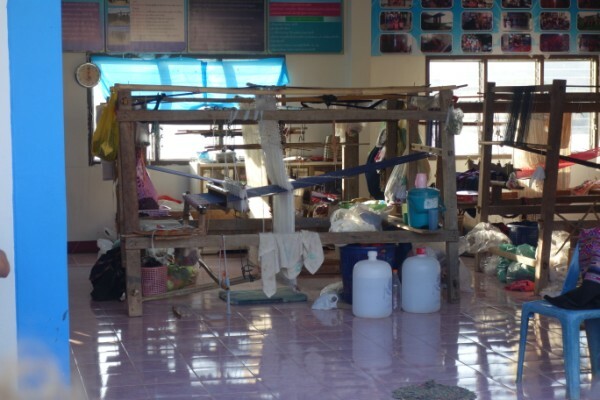 Handcrafts Centre of Ban Phanom (outside L.P.) No weavers were working but an extensive display of textiles. A review on the position of hand weaving in the communities I’ve visited. Because I am a hand weaver I am always interested in the position of hand weaving in a community. In Australia, with various institutions closing and courses being downsized, it is a concerning trend for the future of hand weaving. Both nationally and internationally (USA and Canada in particular as I have had contact there) universities, colleges and other educational institutions (and my past experience at Sturt is included) all show the trend for lack of opportunity to learn weaving. A comment from many guilds is that there are fewer young weavers coming through and fewer people wanting to learn. However I guess we do expect those countries with a strong tradition in textiles eg in South East Asia to exhibit a strong presence of hand weaving. The following summarises my thoughts on what I experienced. 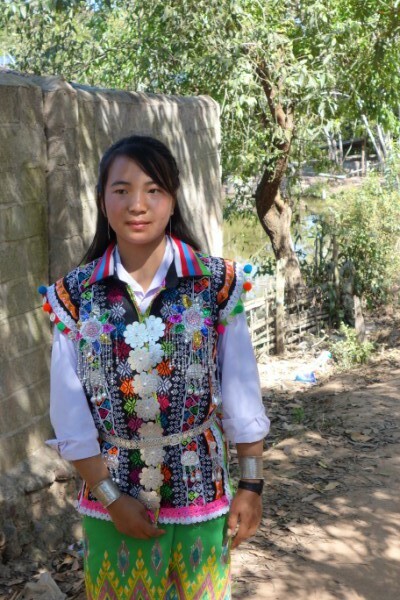 The presence of traditional ethnic minority dress in both daily life and for the tourist does require the maintenance in the main of traditional skills. However there is some incidence of elements being able to be bought in the market and then assembled: base cloth, braids, embroidery. It is hoped that traditional ethnic dress is seen to be an essential component in the celebration of life events such as weddings, funerals and other significant ceremonies. I have no first- hand experience of the extent to which this is true though I heard it mentioned. If this is the case it could result in the production of a textile with a greater skill component. However whether it is created by the person who requires it or by an outside source may be another question. 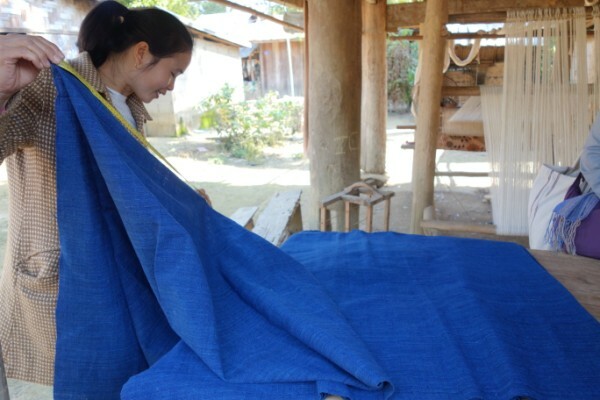 While the Laos government policy of requiring traditional Sinh or tube skirts to be part of a government dress code may have a detrimental effect on some ethnic minority traditions, it does mean that the skills of weaving often supplementary weft patterned skirts is encouraged. I am sure the use of traditional dress to market textiles or other ethnic goods is recognised by minority groups. This will continue to encourage its production. One catches the occasional glimpse of women stepping into their skirts as tourists arrive. Nor do the Akha ladies need an introduction when they approach you to sell. I am also sure that for some ladies what we saw them wearing is their garment of choice. The ready availability of western dress in even the remotest of villages does mean that this has become increasingly the norm. A mixture of traditional ethnic dressed and western dressed women is common in many villages. It does vary between ethnic groups and between individual villages. Rarely does one see a man, a child or adolescent dressed in even an element of traditional dress. In all reality one cannot blame them for choosing to buy something that is cheap, very readily available and requires no commitment to time or energy and skill to create. Mass communication and globalisation has certainly impacted. The same applies to other household textiles. Chinese produced blankets were a very common sight. The readily available mass produced alternative textiles of course impacts greatly on the need to weave or use other textile techniques. 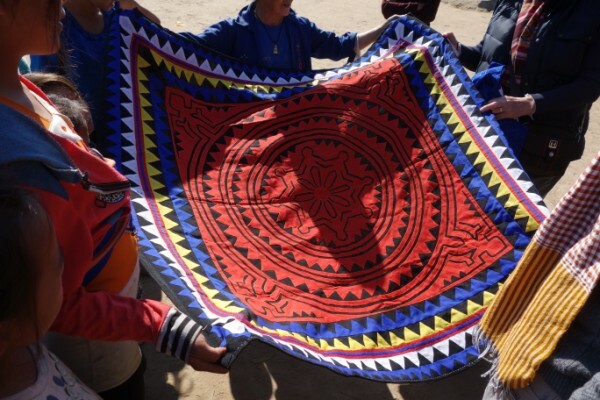 Tourism drives the production of a range of textiles including those woven in ethnic minority villages. Often in one village they utilise similar patterns and techniques though varied in colour. A visit will result in women bringing out large numbers of textiles. As we arrive they may come to greet us with either their bags of textiles or them draped over their arm. Alternatively they may have a more permanent display of poles to drape them on. A visit to a weaving village provides the opportunity to see weaving being done as well as an opportunity for selling. This has a double advantage as the tourist is educated in the process of weaving and its presence enforces the concept that these textiles are authentic and are produced ‘here’. I did note that in a village one weaver was selling for a relative further away. This may explain the presence of a textile that is different. 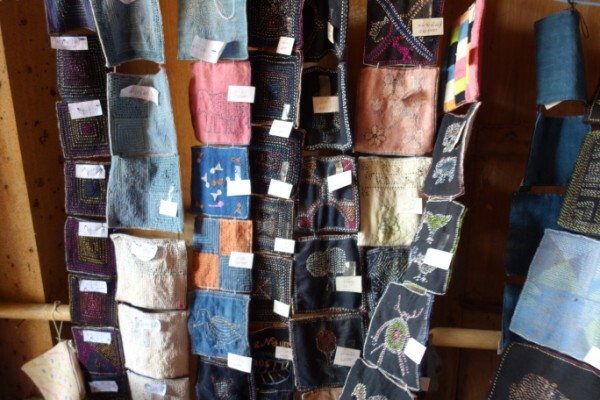 A variety of textiles may mean that a form of trading is occurring. 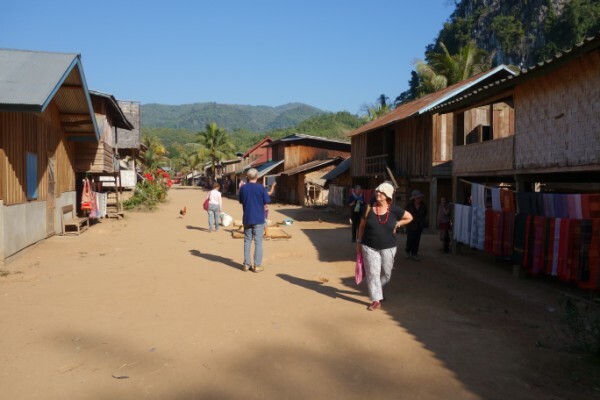 On the banks of the Nam Ou River, this village is well set up for the tourist visitor. Most houses have a rail for the display of scarves. Weaving of traditional styled scarves is obviously a very profitable trade here. Some villagers are more aware of catering to the demads of the tourists. 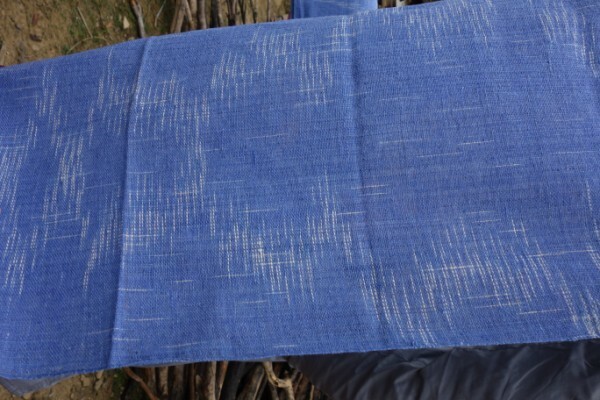 Some villages provide rolls of hand woven indigo dyed cloth. This weaver in this village went one step further and catered for tourists buying indigo hand spun hand woven cotton cloth by the metre. A new product has been developed. Markets and shops in towns and cities provide an alternative point of contact for ethnic minorities to sell their textiles and is easily accessed by all tourists, not just those interested in textiles specifically. One does have to be aware of the danger of not buying authentic textiles. Some imports are easily identified; others require a more discerning eye. 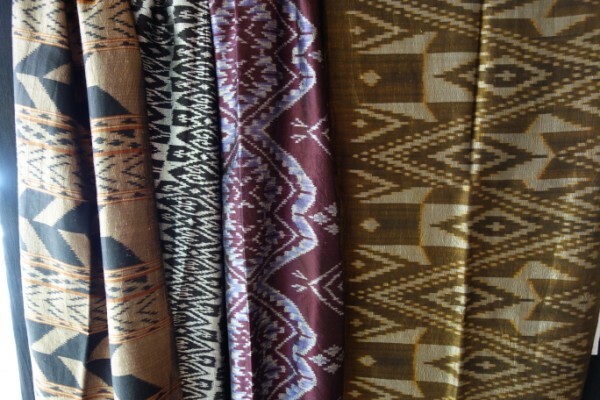 There are even printed textiles that look woven or batik from a distance. 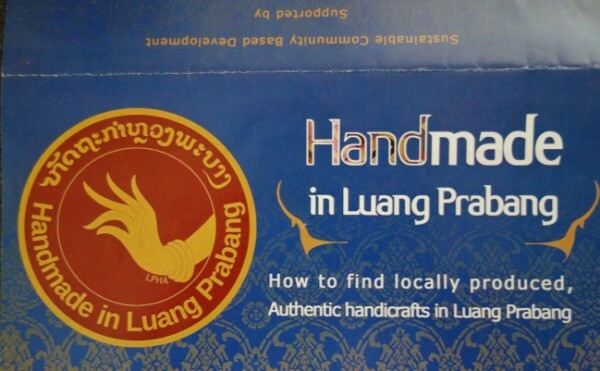 Shops and markets in Laung Prabang have a sticker to identify those woven in the area. Is it foolproof? One hopes that the market is ethical in it’s use of stickers. Some designers, international experts and organisations are working closely with villages to produce work for their outlet. In some cases the textiles have strong links to the past. In others the designs are produced for the villages to weave, dye or embroidered. In some cases the textiles are a traditional format, while in others new product is being produced obviously for the tourist market. Mostly they are using traditional skills as a design base. 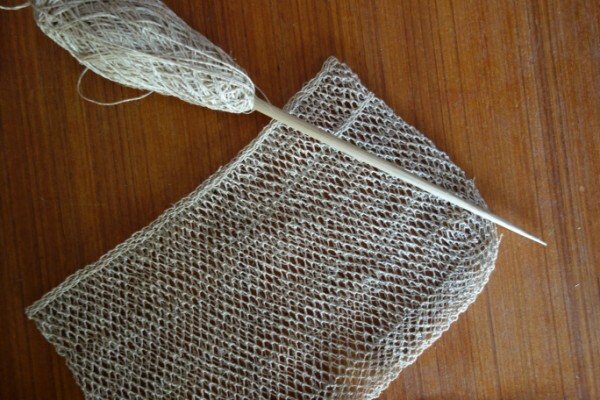 In some areas people are being approached to develop new work, potentially learning a new skill (eg spinning and netting the Kheuapiad vine by the government ageny: Productivity and Marketing Centre of Oudamxay). Quality control is usually emphasised. This contemporary transparency wall hanging in Ock Pop Tok (Luang Prabang) has been developed for the tourist market. 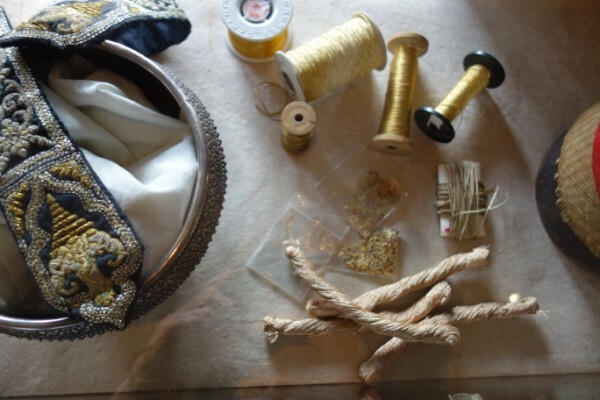 The materials include non tradional elements as well as silk. The transparency technique is certainly non traditional but the inlaid supplementary discontinuous weft has its roots in tradition. In one village I found an anomaly. It was hand spun and woven and dyed in indigo. But there was resist dyeing after weaving /shibori tie dye style. I had not seen it before or later on. I bought it because it was obviously a product of a foreigner teaching a new skill. If the market drives textile production, will my buying mean that this new textiles will become more prevalent? The weaver and then delail of the scarf. We did hear instances of foreign companies commissioning textile production. 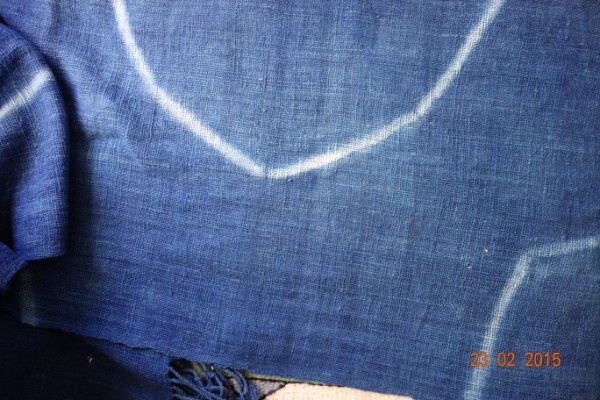 One example was for hand spun, indigo dyed hand woven in plain weave fabric for the Japanese market. The entire community was involved in this production. I wonder if any traditional textiles were produced here or were the entire weaving focus on filling orders. There was several examples of weaving communities obviously working at supplying specific markets. This weaving group has ten looms and mass producing plain weave hand spun cotton textiles in various stripes. Copyright is an issue. I saw a textile that I was told was produced for a particular designer. Later on I saw versions of this same scarf. This means that designers have to stay innovative. 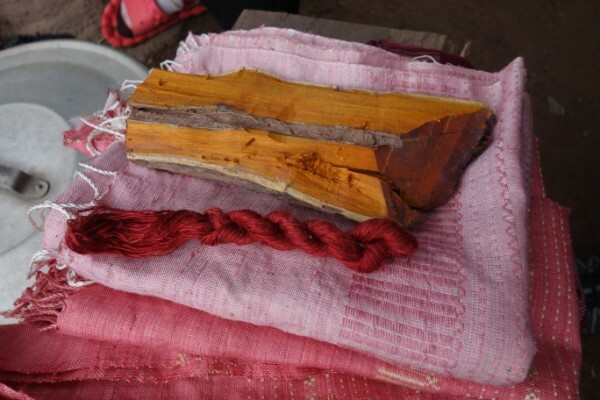 It is an interesting point to ponder: How is tourism affecting the future of weaving? Obviously market demands whether for the locals, tourists or for foreign import will drive textile production. Demand for textiles will encourage weaving (and other textile production) to continue and will encourage weaving to be perceived as a means to earn income and thereby have prestige. Textile work does allow people to stay in their villages. It allows employment in urban towns. People will perhaps want to weave. On the other hand how will market demands impact on traditional skills, patterns and textile tradition? Some weaving techniques (in particular supplementary discontinuous weft) are extremely slow and require great skill. These textiles will also need to be valued for them to be continued to be woven. Who are the weavers? They are women, in the main not the very old nor the very young. Eye sight impacts on the older weaver. I saw in one village girls of late teens weaving. This occurrence was so out of the ordinary that it was noted. Traditionally the young would have been taught by their mothers and the tradition continued. 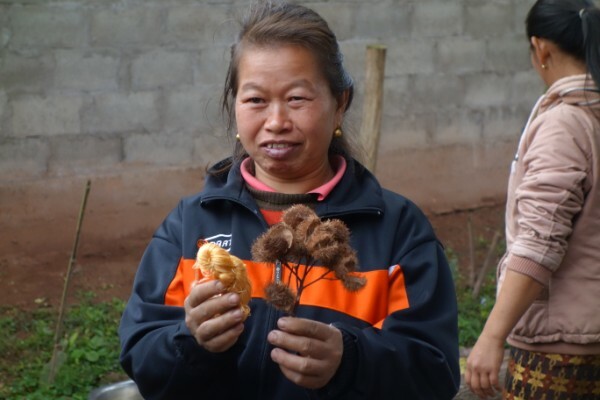 We spoke to one woman who was in charge of a weaving community. She has 3 daughters. None of them weave. They all work for the government. This is not an isolated occurrence. 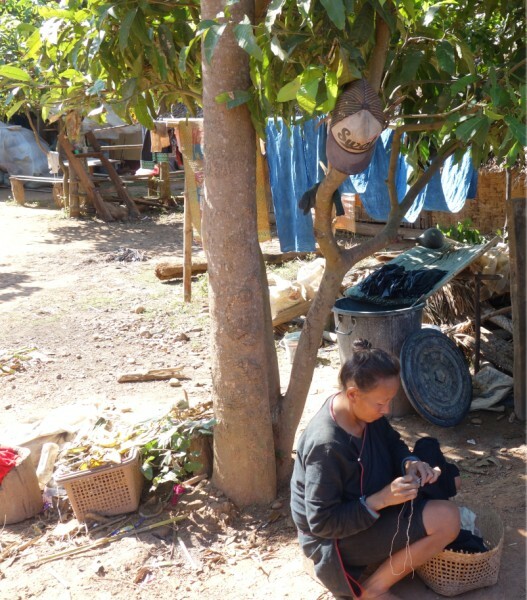 The women we saw weaving must value the ability to bring income in. They are encouraged because of this. Do they weave all year round? Traditionally the time set aside to weaving was driven by the demands of agriculture. They fitted it in. That would probably still be the case in some villages. One could also suspect that where there is commitment to outside organisations that this may be changing. Maybe the weavers weave all year. This potential change may also be supported by change in agriculture production: different demands, mechanisation etc. Change is potentially universal. I did not confirm in any village whether this was the case and how or if time spent in weaving has changed. This is purely my supposition. Nothing is surer: textile production is dynamic and never stays still. We cannot expect what the villagers to have been producing 20 years ago to still be what is woven now and into the future. Technology improves. Materials change. 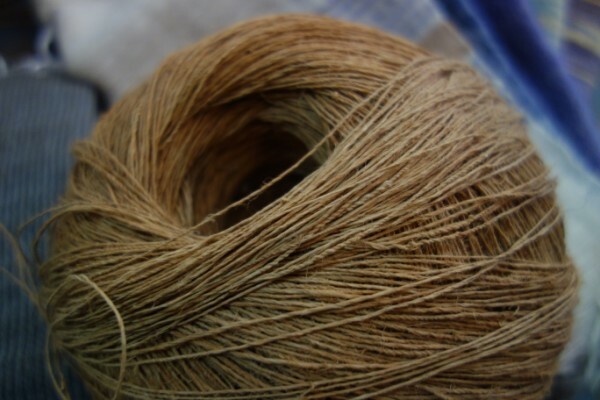 Weavers want to perhaps weave new textiles. Values change. Communities evolve. 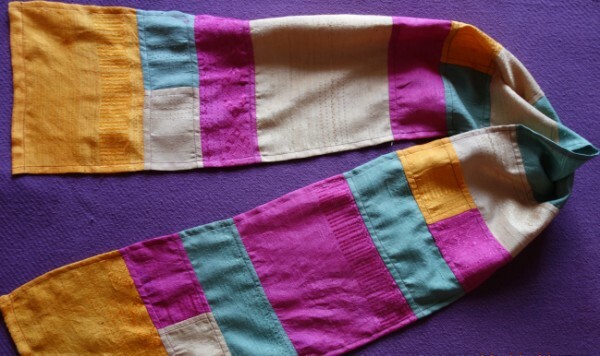 Consumers want textiles of a certain type, whether they are traditional or something new. The outside world intrudes. What does the future hold for weaving here? I guess time will tell. 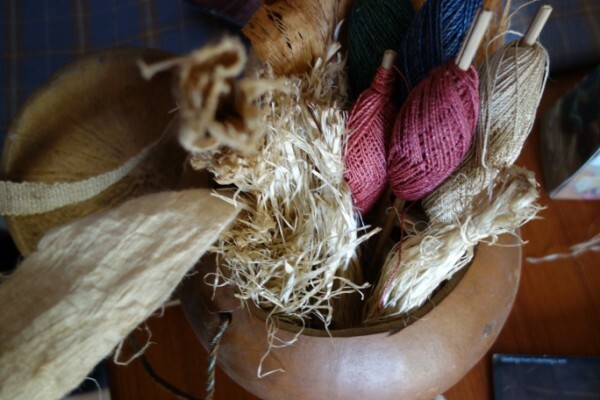 Next month: Weaving, looms and all aspects relating to it in detail. You are currently browsing the Kay Faulkner's Blog blog archives for February, 2015.